Berlin, Germany—When the Merkel government abstained from the U.N. Security Council vote on using military force against Muammar Qaddafi, many international observers were shocked. In the election campaign of 2005, Merkel had lambasted then-Chancellor Gerhard Schröder for damaging the transatlantic alliance by opting out of Washington’s plan to topple Saddam Hussein. But, when it came to Libya, Merkel not only refused to participate militarily, she abstained from the vote altogether. International observers may have been surprised, but, for those of us in Germany, the motives behind Merkel’s decision were all too clear. While the chancellor’s rationale was poorly articulated, the poll numbers were quite vivid: Over 70 percent of Germans oppose the country’s current involvement in Afghanistan and want their troops back home. In exasperation, the Germans have labeled it “Merkelism.” Under this lurching, unpredictable style that has become Germany’s modus operandi during Merkel’s two terms in office, the first thing the leadership does is test the prevailing winds, regardless of positions it had previously taken on an issue. The next election is the long-term perspective for the Merkel administration, which reverses itself as a matter of course, blowing in the wind of popular opinion. This pattern has been evident on an array of issues since the Christian Democrats came to power in 2005, from taxes to nuclear power to the European Union. But how does one explain it? IT SEEMS LIKE an eternity ago that Angela Merkel was catapulted to the front of Germany’s Christian Democrats, a party mired in scandal and lacking both leadership and direction after Helmut Kohl’s 16 long years in power. Merkel was everything that this old-school party wasn’t—a woman, a Protestant, an easterner, a scientist, and a childless divorcee living unmarried with her partner to boot. She had lived in East Germany and hadn’t shown much political inclination at all until 1989, when she walked into the offices of one of the opposition groups to volunteer her services. Merkel’s very person flew in the face of the hide-bound party that Konrad Adenauer built up in the 1950s, and, as such, she was the perfect figure to haul the CDU into the political mainstream of a republic that had changed so dramatically since the postwar decades. At the CDU’s helm, she infuriated the right-wing Catholics who had always weighed in prominently on issues related to gay rights, abortion, stem cell research, and the family. Merkel opened up the prim party to other kinds of conservatives, even ones who happened to be single mothers, gay, or from another country. She enabled a lively culture of critical discourse in the traditionally top-down party and encouraged bright young-bucks like Norbert Röttgen, today her environment minister, who infused traditional conservatism with green-tinged ideas. But, despite her successes, there was never much of a manifesto or program behind her actions—just Merkel being Merkel, and getting her way. It was this free-thinking, independent figure with the quirky biography that appealed to voters, even ones beyond the traditional spheres of the CDU. Yet, because she had sat out the political brawls of the 1970s and ’80s, Merkel hadn’t been forced to formulate and defend her positions on issues ranging from taxes to nuclear power. As the elected leader of coalition governments, she was suddenly forced to stake out detailed positions with implications for policymaking—or, if not, then shift with the political winds to accommodate the convictions of others. This probably explains why Merkel has reversed herself so often. In the 2005 campaign, for example, she adopted a laissez-faire free-market line. But the program went over badly with German voters, and Merkel, who didn’t seem to have believed in it that deeply in the first place, tossed it overboard and embraced the social welfare state with vigor. Likewise, on foreign policy, Merkel initially appeared to be a pro-American interventionist. But lending a hand in the NATO campaign against Qaddafi would have meant presenting a coherent vision of German foreign policy and making a strong case for an aggressive stance, the way Gerhard Schröder and his foreign minister, Joschka Fischer, did during the Kosovo war in 1999. 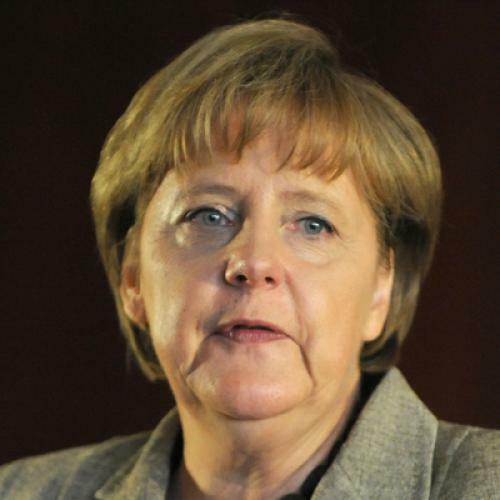 On Libya, however, with public sentiment against intervention, Merkel opted to go with the polls. Probably Merkel’s biggest recent flip-flop was on nuclear energy. Late last year, the conservatives overturned the policies of the prior Social Democrat-led government by extending the lifespan of Germany’s nuclear plants by another twelve years. Then, Fukushima happened, sending popular opinion against nuclear energy soaring and boosting the Greens’ already high numbers in the polls. Merkel responded with a stunning about face, shutting down eight of the plants for good and setting Germany on a course to run most of its economy on renewables by 2050. This U-turn, one German journalist put it, was as brazen as the pope suddenly coming out in favor of birth control pills. Merkel’s loyalists call her style pragmatism; her detractors blast it as flip-flopping. Whatever it is, the party hasn’t stopped hemorrhaging voters at a dizzying clip. The CDU has never again matched its post-unification high of 17 million voters in 1990, capturing only 13 million votes when the first Merkel-led administration came to office in 2005 and losing another million constituents in 2009. It seems very unlikely that Merkel will fare any better in 2013—or that she will even lead the party. Merkel will certainly go down in history as the person who modernized the German Christian Democrats. But she’ll also be remembered for the sheer number of times she has changed her positions. Paul Hockenos is a writer living in Berlin. He is the author of Joschka Fischer and the Making of the Berlin Republic: An Alternative History of Postwar Germany.